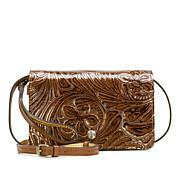 Old world craftsmanship and new world technology collide for an explosion of style. 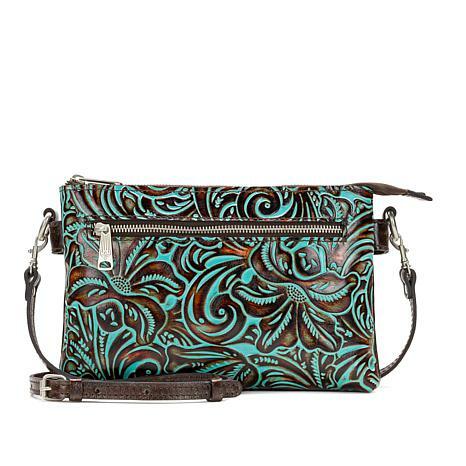 This double-zip crossbody bag features classic Patricia Nash artisan details, multiple carrying options and plenty of pockets for a look that's sure to become an everyday favorite. Bought many map, this is it!! Been looking for perfect pn map bag! Whatever leather, hope its the moscato. Its not got that shiny film finish that all others is gotten had. More natural finish. Which I LOVE! Should hold up better long term also. No snaps! Yeah! Zip n go. 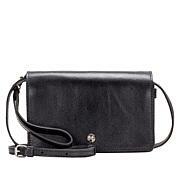 I carry large mk OVERSHOULDER wallet! (Every wallet these days, except small.should always come with over shldr strap.) I carry it, glasses, lots of makeup, cigs, camera, phone charger, phone, use inside zip as money pocket, love card holders. 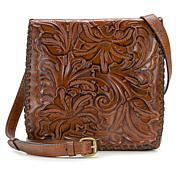 This crossbody bag is really beautiful. The craftsmanship is outstanding. The leather feels amazing. I am so glad I purchased this purse. It is pretty small. I would really prefer it to be about an inch bigger all the way around, but, it forces me to downsize. Just the right size for a medium bag! 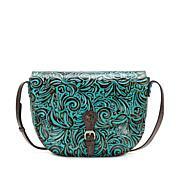 Love the floral print and has enough room for neccesities! Happy with this beautiful bag. I need a smaller purse because I can't carry a lot of weight. This one is small, yet roomy enough for my necessities. I bought the lasered map print and it is a lovely bag. Made very well. Love the bag well made ,the leather is so nice. Can carry a lot of stuff and like the zippers on the bag ,nothing falls out ! I got the map and now it matches the shoes I have of Patricia Nash ! Love the map print !